At the mid-point of the twentieth century, many philosophers in the English-speaking world regarded political and moral philosophy as all but moribund. Thinkers influenced by logical positivism believe that ethical statements are merely disguised expressions of individual emotion lacking propositional force, or that the conditions for the validation of ethical statements could not be specified, or that their content, however humanly meaningful, is inexpressible. Philosophical Dimensions of Public Policy presents thirty-four articles written by research scholars numerous fields-philosophy, political theory, medicine, law, biology, economics, ecology and sociology-treating a broad range of topics in practical philosophy. The Institute for Philosophy and Public Affairs has been home for these ideas, pioneering a distinctive method of conducting inquiry into the moral dimensions of public life, and contributing to public discussion and deliberation. Members of the Institute reject the idea that public philosophy means reaching into the philosopher's tool-kit and "applying" prefabricated theories to particular problems. They set in motion a dialogue between the distinctive moral features of practical problems and the more general moral theories or considerations that seem most likely to elucidate these problems. 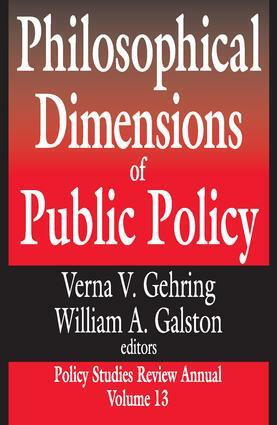 The volume is divided into five areas: "Politics, Civic Life, and Moral Education"; "Diversity, Identity, and Equal Opportunity"; "Human Rights, Development Ethics, and International Justice"; "Biotechnology, Genetic Research, and Health Policy"; and "Natural Environment, Human Communities." Philosophical Dimensions of Public Policy presents empirical data and philosophical arguments with the intention of informing public policy and public deliberation. Scholars as well as graduate and undergraduate students are certain to find it useful to their research work. Can We Put a Price on Nature’s Services? What’s Wrong with Exotic Species?